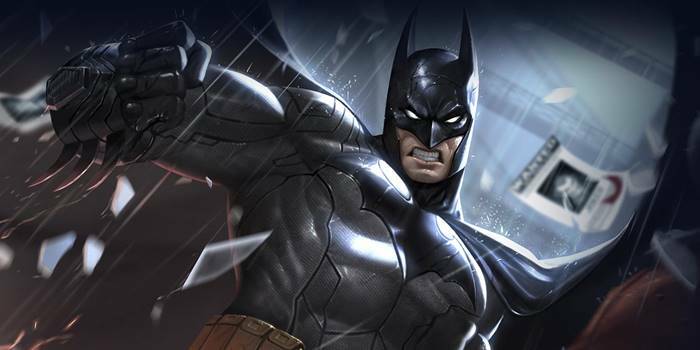 An overview and guide for Arena of Valor's Batman, the Dark Knight. Batman is an assassin/warrior class hero who relies on his mobility and finisher moves. Batman is an assassin/warrior who moves through the shadows to approach his prey before unleashing a barrage of damaging moves. He can be a terror to enemies once they fall into his sights, his movement speed increasing whenever he pursues his prey. Excellent Chaser – Caped Crusader, Batman’s passive, increases his movement speed whenever he chases enemy heroes. This can make him very difficult to escape from, especially when the target lacks movement abilities. Stealth– Batman’s ultimate, Dark Knight, allows him to move unseen on the battlefield. He is one of the only heroes in the game to have a stealth ability. Squishy foes will have to move extremely cautiously across the field to avoid being ambushed by the masked vigilante. Strong Finisher – Batarang does additional damage based on how much health the target is missing. This makes him extremely capable at finishing off foes when ganking or securing kills that would otherwise squeak away from a fight. Damage Falls Off – Batman’s effectiveness is highest in the earlier stages of the game. Heroes are generally much more isolated on the map and thereby much more susceptible to assassins like Batman. As time goes on, though, enemies will start grabbing defensive items and grouping together, making it much harder for the Caped Crusader to properly deal out his punishment. Vulnerable at a Range – As Dark Knight is his main method of approaching enemies, Batman can struggle when caught by ranged enemies. He requires a careful Batarang or quick use of Dark Knight to approach or escape when a marksman or mage tries to kite him. Batman should normally jungle. The increased leveling speed that the jungle offers allows him to get his ultimate quickly and immediately start ganking the lanes. While invisible, nearby enemies will be alerted to Batman’s presence with a mark over their heads. Come into lanes from behind so that the enemy can’t quickly retreat at the first sign of danger. Take advantage of your stealth to scout out the enemy jungle. This will help keep your allies safe and aware of any incoming ganks. Begin ganking as soon as possible. Batman hits his power spike early and it should be abused to ensure an early victory. Start with your Forearm Strike, as it is a much more useful tool for clearing jungle monsters than Batarang. Batarang can be focused to maximum first if the enemies are good at zoning or have a lot of range. The slow and stun it provides can give Batman the time he needs to burst them away. Solo Fights: Approach the enemy while invisible, getting between them and their tower if able. If you are able to get in close by walking, hit them quickly with a combo of Batarang and Forearm Strike before the damaging instance of Dark Knight. If you can’t get there right away, slow the enemy with a Batarang before swooping in with Dark Knight and finishing with Forearm Strike. This along with Batarang’s detonation damage is generally enough to finish off most squishy foes. If the enemy is still standing (or looks to survive the explosion from Batarang,) try to finish them off with normal attacks or another Forearm Strike when it is available. Team Fights: Activate your ultimate before joining a team battle. Remember to wait for its stealth effect to activate before moving towards the enemy heroes. You don’t want to initiate, instead allowing a tank or warrior to do so and draw the first round of enemy fire. Find a squishy target once things get going and jump on them to strike. Take the target down as quickly as possible before moving away. Wait for your normal abilities to recharge before moving in to strike again. Batman can use his second ability to slow enemy heroes who are trying to chase. If available, Batman’s best bet for escaping is using Dark Knight to go stealth or rush away. If trying to sneak away stealthed, try to activate the ability while running through a bush to throw pursuers off. Caped Crusader makes Batman exceptionally difficult to escape from. Several movement abilities won’t even be enough to shake the Dark Knight from an enemy’s trail. This is not only a great tool when ganking, but when cleaning up after team fights as well. Forearm Strike – Batman attacks with his forearm blades and deals 165/186/207/228/249/270 (+0.58 AD) physical damage to nearby enemies. One random enemy will take double damage. Batman’s Forearm Strike ability is helpful in managing minions and opposing heroes in lanes. If focused on a single target, try to only hit them with the ability to ensure that they take the double damage. Batman’s Batarang ability is a good way to follow-up and finish heroes off after a team battle. The ability also enables your teammates to follow-up with their own finisher abilities along the way. If Batman’s initial burst is not enough to eliminate the opposing hero, the second wave of damage can usually finish them off after the fight. It is important to remember the recovery aspect to the ability, as it a useful tool in sustaining Batman. Dark Knight – Batman conceals himself behind a colony of bats and becomes invisible after 1.5 seconds. Invisibility lasts for 30 seconds unless Batman stays within 6 units of an enemy hero for more than 3 seconds. If the ability is used again during invisibility, he will fly towards the target direction, dealing physical damage to enemies in his path. He gains 50% attack speed for 5 seconds after coming out of invisibility.Batman cannot be selected during flight if this ability is activated again while invisible. The area covered by this line ability is rather wide, providing a means to deal damage to multiple heroes at once. Avoid activating the ability in front of your enemies if you can help it, as surprise is one of the biggest parts of the ability. In team fights, observe the clash before joining. Pick a position where you would deal the most damage with the area of effect. The damaging effect of Dark Knight can be cast before the stealth effect has begun and after it has been broken, so don’t feel a slave to using it while stealthed. Don’t venture too far from safety when Batman is missing from the field. You will need to quickly move back to cover as soon as you see that Batman is nearby. Batman is very aggressively focused and will have trouble if forced into a defensive position. Try to get the first blow on him if possible, especially if he has just finished an attack elsewhere. If wanting to fully capitalize on his offensive potential, taking sets of Onslaught, Assassinate, and Skewer is the best way to go. Alternatively, players wanting to get as much survivability as possible can take Indomitable, Benevolence, and Valiance. Batman has a disadvantage against tanks early game. Try to avoid them as much as possible as they can survive Batman’s burst damage and punish him for engaging. Focus on squishier targets instead. Warriors are a bit easier to deal with than tanks, not having quite the same durability of tanks. They are best attacked with the assistance of an ally to ensure that they can be torn down. As with tanks, though, warriors are on the lower end of priority in team fights. Batman has an advantage over other assassins early game, provided he can get the first hit in. Batman’s heavy damage is enough to rip through most assassins’ lower defenses, he having a bit of defense himself to absorb some attacks they send out in retaliation. Best fast though, as Batman’s defenses can’t withstand the full force of an assassin’s combo. Let enemy mages use their single lane or area of effect abilities before moving in on them. Take note that mages have high damage early game, so try to move in unpredictable ways. That said, most have pathetic defenses and thereby can be quickly killed without much problem. Marksmen will be your most prime prey, high priority targets with small health pools make for very desirable targets. Be quick and decisive in your attacks as to finish the fight before the marksman’s allies can respond. Supports can stun or slow Batman, leaving him very vulnerable to outside attack. Avoid them as much as possible, taking the down only after the damage dealers have been taken care of first.